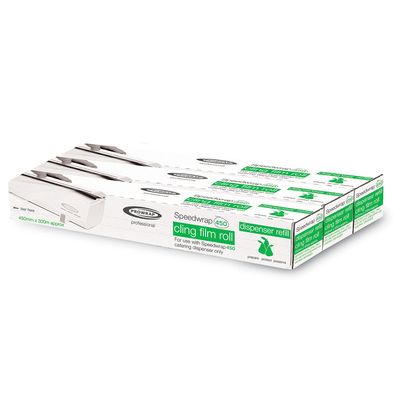 This large and economic Speedwrap Clingfilm for Dispenser pack is perfect for busy catering environments. Each of these large rolls have been designed for use with the relevant dispenser and ensures that you'll be ready for the largest food preparation sessions in your business. They have been cut to a wide catering size and offer a superior cling while also being soft, flexible and strong. From domestic through to professional environments including restaurants, these large rolls ensure you're fully stocked at every meal. For the most convenient food preparation, we recommend pairing these rolls with our Speedwrap Clingfilm and Foil 45cm Dispenser.